Hello Everyone! My name is Vivian and I blog at Dance for 5. 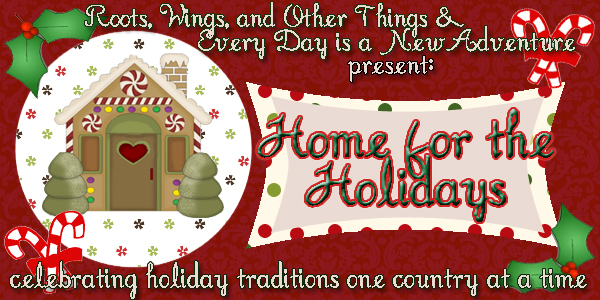 I am so excited to be part of the first installment of the Home for the Holidays series that Alyx and Daryl are putting together. Thank you so much girls for having me! Today I will be sharing with you about my own traditions growing up in Colombia and how I have incorporated them as a wife and mother living in America. Enjoy and please come visit. I heart making new friends! Christmas in Colombia is a religious event also mixed with lots of parranda or dancing/fiesta. 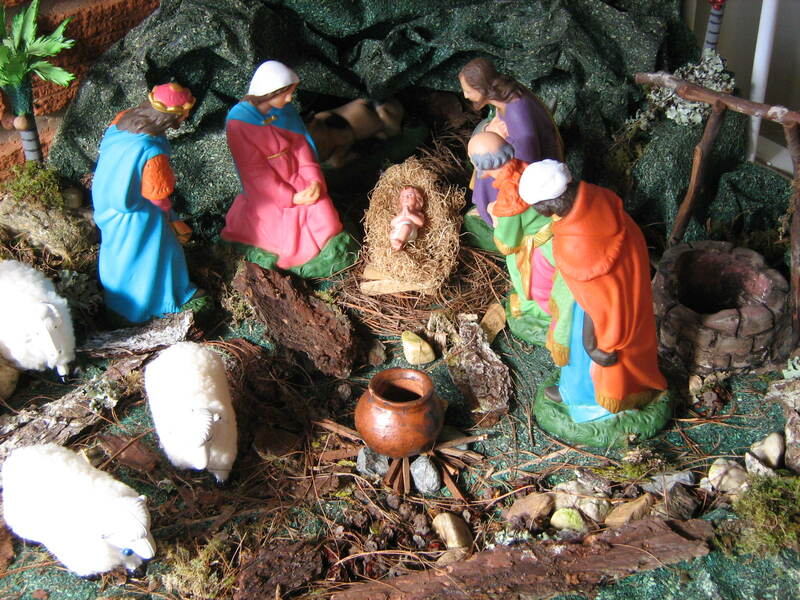 One decoration that is a MUST and found in every household is el pesebre or nativity. My mom would go to great lengths to be very creative and every year make a different pesebre. Some would even have little streams flowing down the hills. I took pride in helping her with the fun task of making them and setting them up under our Christmas tree. In Colombia, Christmas starts on December 7th by celebrating the day of La Virgen de la Inmaculada Concepción or The Virgin of the Immaculate Conception. 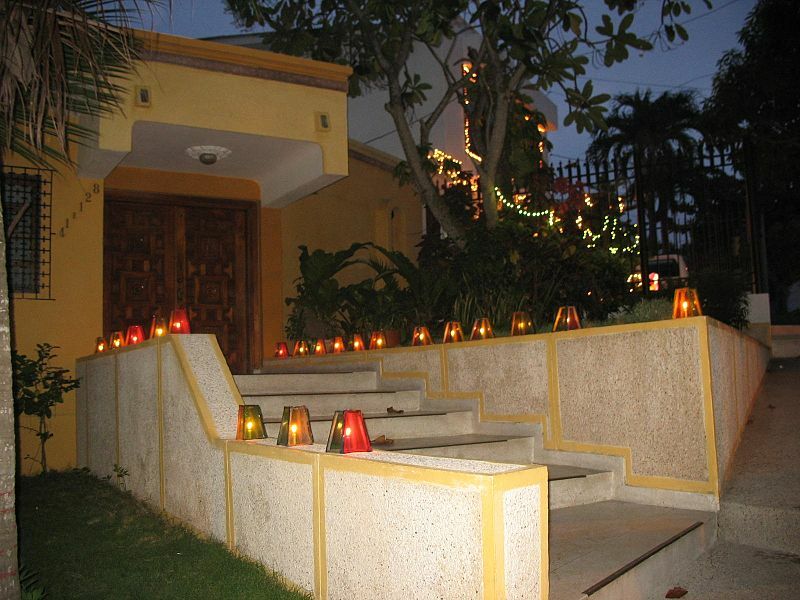 This day is widely known as El Dia de las Velitas or the day of the candles. The day is celebrated by lighting candles and lanterns on long pieces of wood board to make infinite lines that illuminate the front of homes. Simply beautiful! Of course, it all has to be mixed with dancing, music, food, etc. 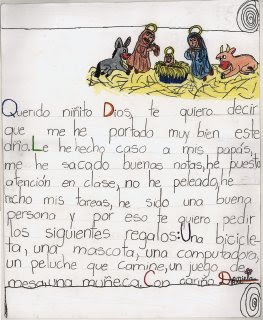 Because Christmas in Colombia is deeply rooted in Catholic tradition we hold what it’s called The Novena. On the 16th of December we reunite with family members, neighbors and friends (and I mean everybody) each night until the 24th to pray the novena and sing Villancicos or Spanish Christmas carols. I remember growing up, that although my family and I weren’t Catholics, we would still participate with the musical portion of it. The novena would rotate from one home to another and everyone would be playing a different instrument. To this day, I sing those Villancicosstrong> with all of my heart and my children have learned to sing and play a few of them, making me proud. Here one of the ones I learned first, and like me, many other children back home. As children we write letters to El Niños Dios or baby Jesus instead of Santa. On Christmas eve we stay up late and enjoy the special Cena de Noche Buena or Christmas Eve dinner accompanied by the lighting of fireworks and paper globes, which are light up and let fly freely in the sky. There is more music and dancing involved. The next day we wake up late and eat left-overs and continue playing more music and having fun. The kids play with their toys received the night before. 1. We get together with our friends a couple of times during December for the Novenas. At the same time we attend company, church, etc Christmas parties including concerts and plays. 2. 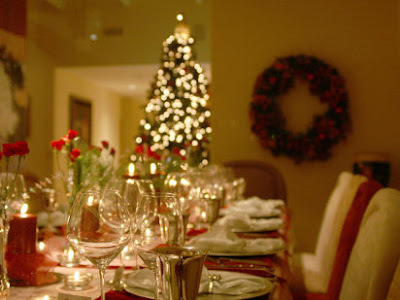 We have a delicious dinner on Christmas Eve and another one on Christmas day. 3. Our kids open presents by El Niño Dios on Christmas Eve and stay up as late as they want to dancing and playing with the Colombian gang (we usually get together with other families and friends who also have small children)and open presents from Santa at about midmorning the next day with my American family. It’s the best of both worlds. I could not ask for a better Christmas each and every year. Wishing you a month full of joy, and above all, a time of peace. Isn't she fabulous! Don't forget to head over to Roots, Wings, and Other Things for a yummy recipe from Vivian, and stay posted for our next guest poster on Thursday! Happy Tuesday! Wow...seriously, I just love hearing about other people's traditions!! Great guest post, Vivian!!! Hi, I just found your blog through Lish at Imprintalish, and love it, have just started following now. Love this post, and looking forward to reading more traditions of Christmas.